Perform 30+ Matrix Computations such as A+B, A-B, k*A, A*B, B*A, A-1, det(A), Eigenvalues, LU and QR – Factorization, Norm, Trace. Step by Step – Simplex Algorithm. 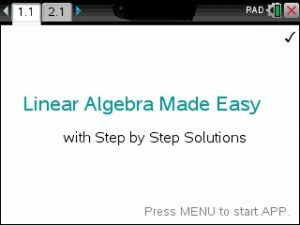 Step by Step – Gaussian Elimination. Step by Step – EigenValues and EigenVectors. Solve any n by n system of equations. Rotation Matrices, Magic Squares and much more. Nullity, Null-, Row- and ColumnSpace Basis.